Only those X-ray machines should be procured by the users that have been type approved by the competent authority. Installation and room layout should be in accordance with the specifications of the safety code. On acquisition (by purchase, transfer, gift, lease, or loan) of the X-ray equipment the user should ensure that it is registered with the competent authority. The Radiological Safety Officer (RSO) should conduct periodic radiological protection surveys of the X-ray installation and maintain records of routine QA tests on the X-ray machine. All radiation workers should use appropriate personnel monitoring badges (PMB). The safety code emphasizes that the ultimate responsibility of ensuring radiation safety, availability of RSO and qualified personnel for handling of X-ray equipment rests with the employer. It is generally presumed that the users take a due note of the requirements of the safety code and a comprehensive QA tests for every X-ray machine are carried out at the time of installation and thereafter as per the requirements of the national safety code. The main objective of the present work was to carry out an independent audit of the important features of QA tests and radiation safety parameters in major medical X-ray installations, which would reflect the safety status in the country, and to assess compliance with the regulatory requirements of the safety code. A large number of hospitals belonging to the government sector, the private sector, and public trusts were approached for inclusion in the study. From among those who readily responded, extended cooperation, and were conveniently accessible to the authors, 118 medical diagnostic X-ray machines installed in 45 major hospitals located in 13 cities in India [Figure 1] were selected for the present study. We feel that this should reflect the countrywide scenario. The audit included major QA tests on every X-ray machine, conduct of radiological protection surveys at each X-ray installation, and verification of the implementation of the regulatory requirements of the safety code. 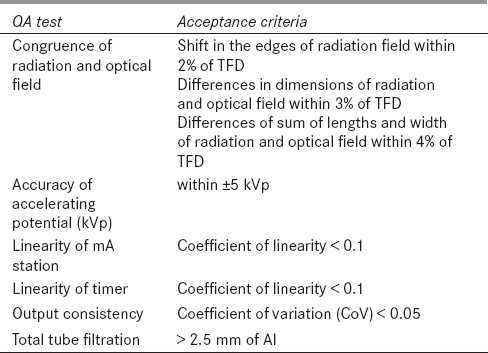 [Table 1] gives the list of models/manufacturers of diagnostic medical X-ray machines - with the important technical specifications [phase / type of rectification, total filtration, maximum ratings (kVp and mA)] - covered during this study. The radiological protection surveys were carried out by using 400 cc indigenously manufactured ionization chamber-based radiation survey meter model Gun Monitor (GM-125), with its calibration also traceable to the National Secondary Standard Laboratory. Radiation outside the personnel entrance door (PED) and windows and other occupied areas. Cable crossings, opening in walls, and other areas behind the chest stand. Occupied areas in and around the installations. The radiological safety and QA audits were carried out by performing major QA tests on 118 medical diagnostic X-ray machines installed in 45 major hospitals in 13 cities in India [Figure 1], thus covering almost all regions of the country. The study covered about 27 different models of X-ray machines. Most of the machines had mA station up to 300 mA. The QA tests revealed that out of 118 X-ray machines, 27 did not meet the acceptance criteria for congruence of radiation and optical field, while a need for calibration was observed in 28 machines for kVp, in 19 for mA, and in 11 for timer. [Table 3] shows the percentage of X-ray rooms and X-ray machines not complying with the requirements of radiological safety and QA parameters as per the national safety code. Some of the observed major noncompliances were with regard to: inaccuracy of kVp calibration (23%); noncongruence of radiation and optical field (23%); nonlinearity of mA station (16%) and timer (9%); faulty adjustor knob for alignment of field size (4%); nonavailability of warning light (red light) at the entrance of the X-ray room (29%); having mobile protective barriers without lead glass viewing window (14%); improper collimator/diaphragm (19.6%), etc. The observed noncompliances were communicated to the concerned hospital so that immediate corrective actions could be initiated. The manufacturer/supplier of the X-ray machines were consulted by the concerned hospital to rectify the technical problems of the X-ray machine relating to accelerating potential (kVp), mA station, timer and alignment of radiation, and optical field and replacement of the faulty field size adjuster knobs. Four hospitals discarded the faulty X-ray machines. With regard to radiation safety parameters such as provision of warning light (red light) at the entrance of X-ray room; replacement of bulb inside the collimator; and making modifications in the layout of the X-ray room to relocate the chest stand, control panel, patient waiting areas, dark room, and mobile protective barriers, etc., from a radiological safety viewpoint were corrected during the course of the visit to the hospital for this study. The replacement/provision of mobile protective barriers with a lead glass viewing window and availability of personnel monitoring badges were confirmed by the hospitals subsequently. In view of the observed noncompliances with requirements of the safety code and in the interests of radiation protection of persons in working in diagnostic radiology, we suggest that a suitable method be established in the country for verification of effective adherence with the provisions of the national safety code by the X-ray departments of hospitals. For this purpose, it is necessary to establish a Radiation Safety Directorate/ Agency for medical X-ray practice in every state of the country and also a nationwide network that would involve medical professionals and relevant institutions/authorities such as government health authorities, qualified radiation protection professionals, e.g., medical physicists/radiation safety officers (RSOs) of cancer hospitals. This would contribute significantly to the proper monitoring of medical X-ray installations all over the country and improve radiological safety standards. This audit revealed that the state of awareness regarding radiological safety, even among the radiologists in the country, is far from satisfactory. Among general physicians, this awareness is still less and often nonexistent. In view of this and because there are a large number of medical X-ray diagnostic installations in the country there is an urgent need of organising periodic nationwide awareness programmes by relevant medical professional bodies on radiation safety and regulatory aspects applicable to medical X-ray diagnostic practice. The findings of this radiation safety and QA audit provides valuable inputs for organizing such awareness programmes. The study thus contributed significantly in improving the radiological safety status of major medical X-ray diagnostic installations in the country. The radiological safety and QA audit of 118 medical X-ray diagnostic installations in India revealed several instances of noncompliance with the requirements of the national safety code; these were addressed and corrected. 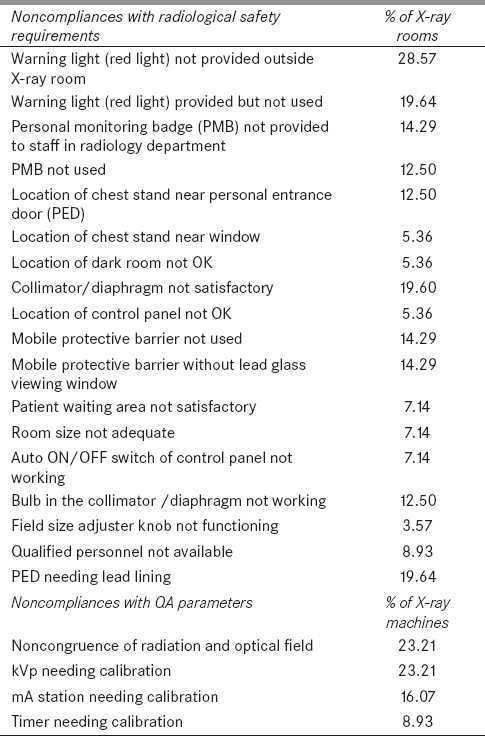 Some of the major noncompliances were: inaccuracy of kVp calibration (23%); noncongruence of radiation and optical field (23%); non linearity of mA station (16%) and timer (9%); faulty adjustor knob for alignment of field size (4%); improper collimator/diaphragm (19.6%); nonavailability of warning light (red light) outside X-ray room (29%); use of mobile protective barriers without lead glass viewing window (14%), etc. This survey generated awareness about the need and importance of in-house periodic radiological safety and QA audits to ensure optimimal radiological protection for patients, occupational workers in diagnostic radiology, and the public. This study makes significant contributions for improving the radiological safety status of medical X-ray installations in India and could provide a vital feedback in reviewing and preparation of regulatory documents pertaining to medical diagnostic X-ray practice. 1. Bennett BG. Exposures from medical radiation world-wide. Radiat Prot Dosim 1991;36:237-42. 2. International Commission on Radiological Protection, 1990, Recommendations of the Commission on Radiological Protection ICRP Publication 60, Ann. of the ICRP 21 (Oxford: Pergamon). 3. International Atomic Energy Agency. 1996 International Basis Safety Standards for protection against ionizing radiation and for the safety of radiation sources. Safety Series, No. 115 (Vienna: IAEA). 4. Chougule Arun. 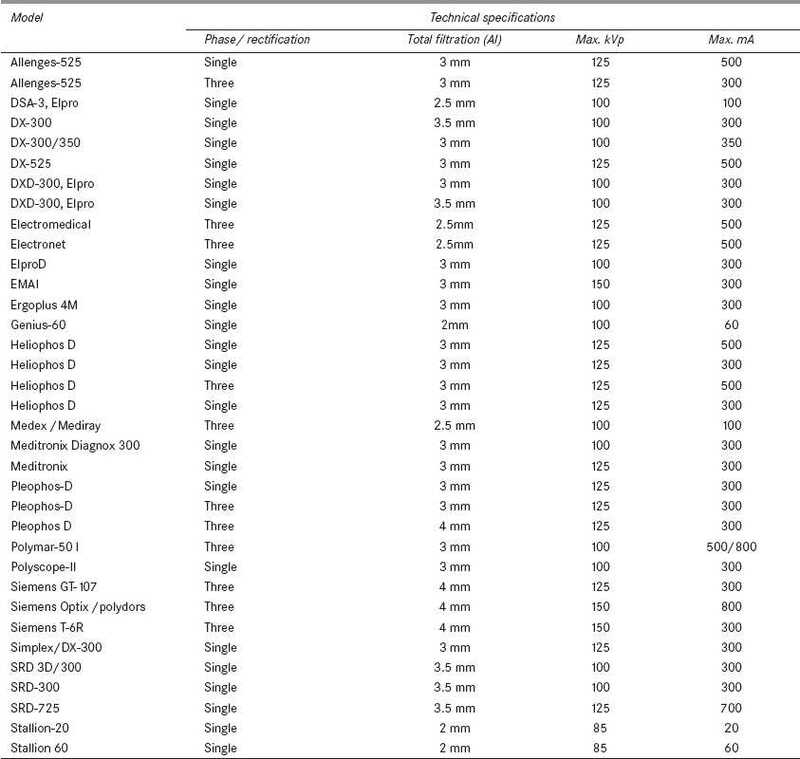 Reference doses in Radiological Imaging. Pol J Med Phys Eng 2005;11:115-26. 5. Sonawane AU, Shirva VK, Pradhan AS. SEDs and safety audit of diagnostic radiation installations in four hospitals in India. Journal of Medical Physics 2003;28:109-11. 6. Sonawane AU, Iyer VS, Rane DM. Radiological Survey of Medical X-ray Units in the State of Madhya Pradesh, Journal of Medical Physics 1999;24:123-5. 7. Iyer VS, Rane DM, Senthilkumar C, Sonawane AU. 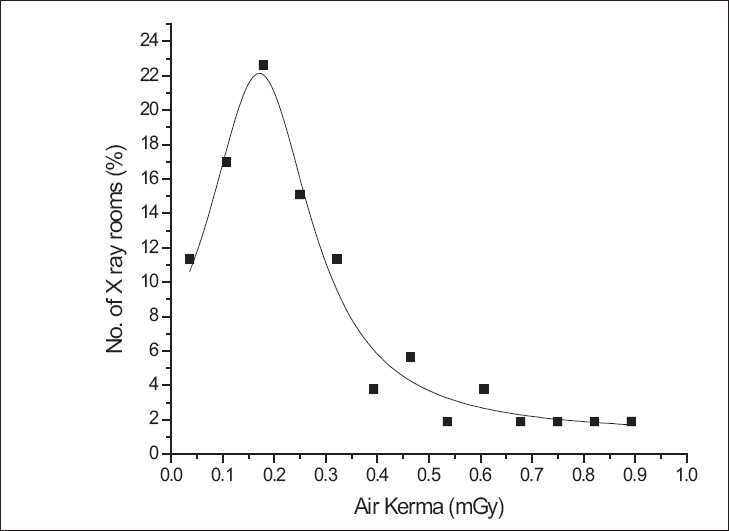 Regulatory Control and Radiation safety in X-ray Diagnostic Installations in India, Indian Association of Radiation Protection (IARP): Proceedings of 24th IARP Conf; Surat; 1999. p. 145-7. 8. Atomic Energy Regulatory Board, Annual Report 2008-09. 9. Notification No. 30.1.2002-ER/Vol.II/2875 dated 12-10-2006, Appointment of Chairman, Atomic Energy Regulatory Board as the 'Competent Authority' of radiation protection in India, The Gazette of India, Part-II, Section 3, Sub-Section (ii). 10. Notification No. 25/2/83-ER dated 15-11-1983, Constitution of Atomic Energy Regulatory Board, The Gazette of India, Part-II, Section 3(ii). 11. AERB (Atomic Energy Regulatory Board), 2001, Safety Code for Medical Diagnostic X-ray Equipment and Installations, No. AERB/SC/MED-2 (Rev.1) published by AERB, Mumbai, India. 13. Sonawane AU, Shirva VK, Butani ML, Kulkarni Arti, Pradhan AS. Response studies of three different dosimeters for SED measurements using diagnostic X-ray machine, Proceedings of International Conf. on Medical Physics, India, 29, 2008. 14. American Association of Physicists in Medicine, July 2002, Quality Control in diagnostic radiology, Report of Task Group #12, AAPM Report No. 74 (Medical Physics Publishing).